A 7-segment LED you mean? That would require a lot of logic gates and stuff. lol. But it would be pretty darn cool. If only the Power supplies generated more light. I cant delete my own posts!? well i propose that a seven match loop is exactly 1 msec (minecraft second) as for deciding when night time is, count thow many times it gets darker, and on the last start the clock, vice versa with day, if i had enough time i would count this myself. That's why there's a sun and a moon there though. Could be me, but I never see it when I'm spelunking. Really? Well then how would you see that GIGANTIC mountain-clock? I've built a half adder, the video may still be processing though. I'm not sure if the sound is in yet..
Each switch is a one bit input, and the doors output either 1 or 2 bits depending on which one is open. Ignore the hacks, enjoy your logic! Ok srsly I don't get this.. Wtf are not gates? What can you do with it. A not gate is a sort of inverse thingy... yeah. If you have a glowing red trail going into it, the trail coming out will not glow. And vice versa if you have a dim trail going into it, a glowing trail will lead out of it. A really bad screenshot of a JK flip flop. He always making something really clever out of stuff like this. I've had enough with pulling all nighters for sandbox games, so I couldn't do anything past the basic logic gates. I made a more neat and organized thread, but this one beat me by a few minutes, and is prevailing. I'll be making the 7 segment display. An interesting use for NOT could be an item on a pedestal, pick it up and the room floods. DEAR GOD MAN. You could create wall defenses with this. It would be tricky to get it to work for all the blocks though. The circuit would be complete with the block existing and the result would be off. 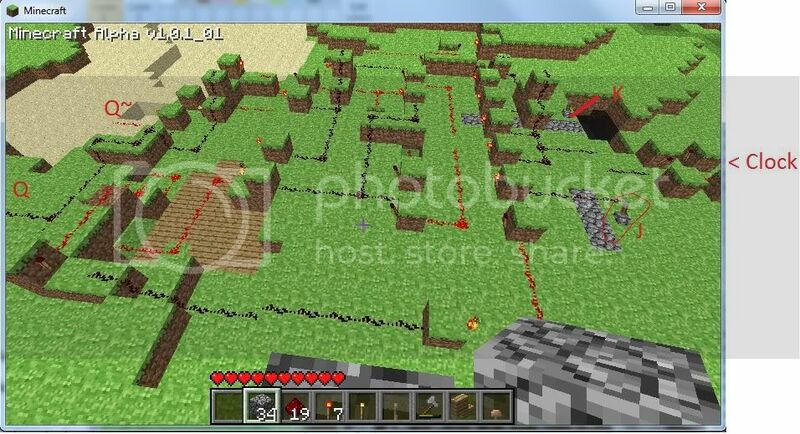 But when the block is removed the result is turned on - which could be used to activate TNT. Basically, have a circuit that takes a total of ten seconds to make a complete cycle, but increments once per second (like an actual clock), every time it makes a complete cycle, it increments a circuit to the left by one, up to a total of six times, basically making a minute counter. I'm not sure if we have the materials/parts to do this yet, though. Of course, I'm guessing this can be done for more than 2 inputs.